If you would give a violin maker a challenge what would it be? June 26, 2017, 10:01 AM · Sometimes I am wondering if the challenges I am giving myself as a maker do really correspond with what players really want. So where are the challenges for the future? Is it really enough to make louder more powerful instruments? (That seems to be the recent trend.) Or are there other challenges? June 26, 2017, 10:10 AM · I myself want a training and family violin. It should be really responsive, have a good dynamic range, all the colors, can be played in all registers, be somehow powerfull high on the g string BUT not loud! Never played something like this. It should still sound open. Edited: June 26, 2017, 10:33 AM · Simple. Make a new instrument that responds as well, and sounds as good, and looks as beautiful, as an old Italian. June 26, 2017, 10:57 AM · Just a fiddle that plays everything without me having to do anything. It just does it for me while I prop up the bar and enjoy life. I think a violin should be female and available for my every whim. June 26, 2017, 10:58 AM · Build the perfect viola. June 26, 2017, 12:41 PM · Dear Andreas I think you very well know how a fine violin must sound. But a particular weakness that I noticed recently when I had the privilege to test an array of 10 really fine violins is the high D on the E-string. That note tends to "vanish". You play C#, it's clear and loud, you play E flat, the same, but the D right in between there is weak and the violin somehow blocks. The only two violins that did NOT have this weakness was a Michele Deconet and a Gasparo da Salo. Talk about violin heaven! There was also a Strad and it too had the weakness, albeit to a lesser degree. Of course you don't want to resolve the weakness at some note at the expense of another note vanishing (perhaps on other strings). So I guess there is your impossible challenge? Edited: June 26, 2017, 1:45 PM · Jean, I would suggest that the "vanishing" D may in part be a function of the E string material, steel in particular. I have noticed that on a gut E that high D comes through more clearly than it does on steel on the same instrument. Of course, in the recording studio the sound engineer can (and does) work miracles! My personal challenge to the violin maker would be a fine violin that has everything except wolf notes. Unfortunately, even some of the best old Italian violins suffer from this pest. Edited: June 26, 2017, 2:30 PM · Jean Dubuisson, violins resonate between C# and D. That's probably a wolf tone related problem, something to do with how the violin behaves under C# or D. I'm sure you could manage to fix that problem by adding some kind of wolf killer gadget, like putting that thing in the string (like cellos) or those little magnets (like cellos too). These are just ideas, but you get what I mean. In the ribs (sides) as well. It's up to the luthier what he wants to make or create. He must has a sense of art to know what would totally destroy the aesthetics of the violin and what not. I love violins that have a story to tell, and it would be really great if a luthier could "carve" a meaningful picture or scene somewhere. Edited: June 26, 2017, 2:29 PM · How about a violin where you can plug your iPod into the scroll and it plays Lindsey Stirling tunes while you twirl around. Edited: June 26, 2017, 2:43 PM · Those were just examples, Paul. Some may like the first one, some may hate it. 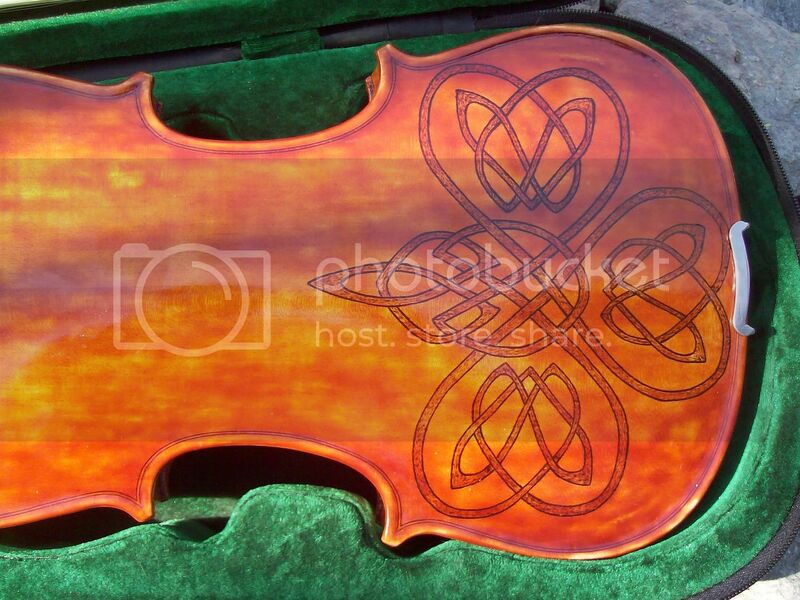 I personally love the last one for a fiddle, I find those kind of decorations amazing for playing a fiddle, playing Celtic music with one of those. For a violin you can make something classier. In example, the third picture is from a very well respected violin maker, it was not made by a lunatic luthier that was bored. It can look way too exotic and "mean? ", but if the violin sounds like heaven and has those "paintings", it can add a very good value to the instrument, since the moment you take it out of the case, it's recognized by everyone. You need an expert about violins to distinguish between a copy of a Stradivari and an original. You know, it's another thing to "think outside the box" and sell your really personal violins, recognizable by everyone. I'm kind of bored of the copy, copy, copy, copy thing. Everyone wants to make a violin that looks exactly as a Stradivari or Del Gesu. All 4 voices in Bach's fuga! Edited: June 26, 2017, 5:03 PM · A resonant viola that plays like a violin. BTW, I fell off a brancb of the Preuss family tree. Wonder if we share some genes;-). June 26, 2017, 5:04 PM · __Let's see-- a small 5-string Viola with the added E-string, a cut-out or viol-shaped right upper side for the high positions, a quality cordless microphone inside, mounted on the end peg, purple lightning bolts painted on the sides. June 26, 2017, 5:50 PM · Sorry Tim, whoever painted the painted lady on the back should stick to violin making. Notice how he hid her hands? That's because hands are hard to paint. June 26, 2017, 7:07 PM · Decorations on a violin usually look awful. I have not yet seen any that actually improve the appearance of the violin. Edited: June 27, 2017, 3:14 AM · The vanishing d is caused by the g string afterlength. In a lot of cases its tuned to that d and consumes energy that is not hitting the violin body. The same way you can outtune wolfs with the afterlenght. June 27, 2017, 6:56 AM · Building one is one thing, put playing one in orchestra another. I have seen players rejected because of lefty violins. June 27, 2017, 11:10 AM · How about a violin with adjustable tone? A control that acts on the sound board to change the tone. You could then adjust to to your preference for a given piece of music. An adjustable porting system or a way to loosen/tension the soundboard. A way to change the characteristics of material with regard to shape giving the material multiple characteristics. June 27, 2017, 12:12 PM · Oh and I want it to fly too. Edited: June 27, 2017, 12:31 PM · You can make any violin fly. June 27, 2017, 12:33 PM · @Timothy. We already have tone control, it's called a bow. Since the left thumb isn't really doing anything, why not make a violin with a thumb wheel that can be used to change the pitch of all four strings? Spin the thumb wheel and it automatically adjusts all four tuning pegs a half tone per click up or down. That way, when we find a piece written in F, we can simply click the thumb wheel up a few notches and pretend we're in D. No need for us beginners to learn anything beyond first position, or stretch out that nasty gap between the second and third finger! Edited: June 28, 2017, 7:11 AM · hi Madeye, I know you were just joking, but every joke contains something serious, and you are making two mistakes concerning first position. first: even if a piece is entirely within the range of first position you still want to use position playing to play a certain passage entirely on one string for uniformity of sound; second, actually first position is the most difficult in terms of spacing between the notes, from third position on this aspect is actually much easier. so first position is definitely not the easiest position in any absolute sense. keep up the good stuff! Edited: June 28, 2017, 7:13 AM · Craig lol. If I take my violin on a 747 it can fly. I hope none of yours ever go into flight and I mean that in a good way. Carlo given that logic I could say, They make a thing to stir ingredients in a bowl. They call it a spoon. This is true. They also make powered mixers. Which do you prefer? OK everyone can go home now. The old ways will always be the best. Everything else is impossible. Nothing to see here :) Let's jump into the Model T so we can go send that telegram. I think it would be an incredible thing to have a violin that could change tonal personality. One of the reasons we like different violins. Marc. I like the Blue violin. Thanks. June 28, 2017, 7:16 AM · Lydia Leong: One thing which was on my mind recently was to build the lightest violin in the world. And doing so one needs to think about absolute minimum size. If a 'normal' violin weights something like 400g (and that's already light) would it be possible to make a violin as light as 300g?? June 28, 2017, 7:18 AM · Craig First: Perfect viola? You know the problem! And this is no viola joke! It is one of the ultimate challenges. June 28, 2017, 7:37 AM · jean dubuisson: I'll keep an ear on it! June 28, 2017, 7:38 AM · Timothy Smith: I think there was a violin maker in Germany in the 19th century who invented a screw device between the upper and lower block of a violin to 'screw it'! June 28, 2017, 7:43 AM · Edward Torgerson: Violas are definitely always a challenge. Concerning the Preuss family tree, I don't know of any members in my family that have emigrated to the US. June 28, 2017, 7:44 AM · Even somehow carved tailpieces and pegs end up looking like the sort of trinkets you can buy on the street in Mumbai. June 28, 2017, 7:45 AM · Rocky Milankov: Very poetic response! Need to remember! June 28, 2017, 7:47 AM · A.O. : You mean the neck as thin as possible? There are certainly possibilities no one has ever thought of. June 28, 2017, 7:50 AM · Madeye Hobbit: Hmmm this requires some engineering skills: In the end this is probably easier made with the help of electronics. June 28, 2017, 7:51 AM · Paul Deck: lol Maybe this is the way to become the Stradivari of the 21st century! June 28, 2017, 7:55 AM · Marc Marshall: Well, that is very specific and usually the way the ultimate challenge is described. But where is your idea which is out of the box? Edited: June 28, 2017, 7:38 PM · "I'd say to find tasteful ornamentations is quite difficult"
I agree,there you go, that's the challenge. I also like very subtle decorations, but who knows, I'm pretty sure that some luthiers with a developed sense of art could totally make some ornamentations that are not that subtle but make the violin look incredibly amazing and personal. It's all about embellish even more the violin. It's a big challenge because you can ruin in few minutes something that has required hours of work. Reading your replies I think that you are pretty much asking for challenges that improve the violin sound in some way, instead of challenges in general. Hermann Jantzen makes a fantastic small Del Gesu model with quilted maple backs. It was by some measure the best of his (very good) instruments that I have seen. So much so that if I weren't 6'1", I might be playing one. June 29, 2017, 5:15 AM · Make one that is incredibly rich. So rich and thick it makes you imagine syrup while playing it... but be able to play high on the G and D and E strings flawlessly as long as he player is able to do so. But also give it the ability to play LOUD. Make it beautiful both visually and musically. A violin that has those qualities is my dream and I have never been able to find it. You would be my life hero if you made this. June 29, 2017, 5:26 AM · "I am wondering if the challenges I am giving myself as a maker do really correspond with what players really want"
They probably do for the most part. From what I see, violinists and violin makers are a very conservative bunch, and to support that I don't even have to mention that what they still aspire to is to have instruments that are just like ones made 300 years ago. Violin makers also seem to me to want to do things the hard way whenever possible -- a very long laborious process using hand tools, touch and ears whenever possible, never mind the possibilities for doing things any differently. If I was to suggest geared pegs, I would probably set off another argument about how good luthiers and violinists do perfectly well without such extravagant devices. Philosophically, I'd say that the hardest challenges are personal -- things we need to overcome in ourselves; to do things we don't want to do. Overcoming 300 years of inertia in the maker and player community is not just difficult, it's nearly impossible. Sure, nobody minds side projects and one-offs for fun, but very few take them seriously. The things I would think to be of the greatest benefit -- e.g. much better quality student instruments, are out of the consideration of most luthiers, as after initial design, the problem becomes one of mass production, which is counter to their practice. And if we're thinking then of singly-made instruments for individual purchasers, we're thinking of high cost and protection of investment, so we're thinking about 300 year-old instruments again. Edited: June 29, 2017, 10:15 AM · Tim Ripond: yes, ornamentation is bit of a secondary thought but still I think your view on it is interesting and challenging. Sometimes I was wondering if the color scheme of violin varnish is not a bit poor. From yellow to red with all hues of brown in between and eventually black. It would be an interesting idea to use unusual colors such as green and blue. With the flame pattern underneath there are plenty of artistic possibilities to make something very attractive. Artistically I would search for some abstract visual elements. Maybe patterns which contrast the wood pattern underneath can make an interesting visual surface. In a very simple way art work of famous artists could be 'recycled' as well. Anyone who wants to see a Mondrian ornamented violin? Or maybe Kandinsky? Imagining that the picture would run over the edges might create an interesting effect. There was a Bowmaker in England who once created the caprice bows. A set of 24 bows ornamented with the first bar of paganinis 24 caprice on one side of the frog and on the other side with a caricature of Paganini. Why not for violins?? There are plenty ideas. Or maybe there is a way to translate the actual sound in colors and patterns. There are people who have the ability to see pictures when listening to sounds and music. Edited: June 29, 2017, 8:06 AM · "Sometimes I am wondering if the challenges I am giving myself as a maker do really correspond with what players really want." So far, it seems to me that players mostly want the usual: sounds great, looks like a nice, old violin. All these other ideas might sound cool to make, but let's see the down payment for something abnormal. Curtin got a nice grant to experiment with, so he can do things that he feels like doing, without worrying if he can sell it or not. Most makers don't have that luxury; the real challenge is to make a living. I would love to make a 5-string violin some day. Great challenge to get the E and the C to both be strong. And a small (40cm) viola with power. But I don't have a commission for those, and I do have commissions for violins. So those cool things sit on the back burner for now. June 29, 2017, 8:49 AM · what players really want? ... an instrument that has all the characteristics of an old master instrument, that doesn't require to take on a 10yr mortgage! So here's the challenge, make such an instrument, using modern woodworking techniques and equipment to drastically (like 1/5th the time) cut down production time, yet produce such master level instrument with consistent result in the sub $10K range (buyer's price). June 29, 2017, 9:39 AM · I really like the Joseph Curtin stuff and would certainly buy one if I had the cash. Gamba corners and a different design scroll and 'f' holes would be a must. I currently own 3 cornerless violins and a cornerless viola. As much as I like the old instruments I'm pretty bored with new instruments looking identical. I think Chippendale furniture looks very beautiful but I think reproductions look tacky! For those of us that work in other fields there are different requirements. For the session musician who plays close to a microphone a violin designed to project in a big space can sound harsh. There seems to be a lot of emphasis on better tone but not on different tone. Some of us play electric or electro acoustic - that is a pickup on a regular acoustic violin. There is a problem with amplified acoustic instruments in that they have a feedback threshold. Some kind of adjustable f- holes would be good - something where they can be closed where needed. I have seen a Susan Manzer guitar where there was a sound hole on the side that could be adjusted for tonal reasons. Extra strings are always good. Although 5 string or more is a challenge to get to work right acoustically, a pickup can compensate for the inconsistencies. I always think that, for a maker, solid or semi-solid electric violins are much simpler to make and there is a market. Check out https://www.electricviolinshop.com for ideas on the high end instruments. High end is around $5000. June 29, 2017, 12:56 PM · I think most of these "innovations" you're talking about have already been made and are available on ebay from China, of all places. -Tornavoz for violin, but designed for close mic, even levels, anti feedback applications and not really for an increase in sound projection. A lot of violinist require a good sounding "Mic" violin for live shows and recordings. There could be a market here for this type of instrument. June 29, 2017, 11:05 PM · But which frequency do you like to push if you dont listen and evaluate? June 29, 2017, 11:46 PM · I heard that powerful projecting smallman in the guitar world made a greater projecting guitar using a honeycomb bracing system. I wonder if there are different alternatives to a bassbar that can support lighter graduations to make a violin under a certain weight class with a supportive full tone. Edited: June 30, 2017, 12:08 AM · Thomas, I was thinking that it might be possible to reinforce a violin top with nomex, ala guitar double tops, and then use something extremely delicate - a balsa veneer - for a soundboard with just the bass bar, as usual. You might also require a guitar style bridge patch and soundpost patch to keep either from punching through the delicate top, however. The problem with lattice braced guitars (alla Smallman, Redgate, etc) is the tone is different from traditional fan bracing. I find it has a more nasal, hollow quality - as if one is playing a little too ponticello all the time. That is of course my personal observation and preference - the trade offs are often worth it - increased volume and projection, as well as increased response. That said I would prefer a double top with fan bracing, it's a better middle ground. Of course my guitar is just traditional fan bracing. I do not need to play over an orchestra, or fill a hall with 2,000 seats, nor could I afford a mid-high end luither instrument. 15 grand for a Redgate is outside of my present budget! 25 for a Hauser, hah! Even more so! I would worry that a similar change in the tone of a violin would turn too many people off from it - the violin world is a little on the conservative side. Some of it looks odd for the sake of looking odd to me, but things like the banked fingerboard could be a boon to players with left hand and shoulder issues, like me. Hermann Jantzen makes a fantastic small Del Gesu model with quilted maple backs. It was by some measure the best of his (very good) instruments that I have seen. So much so that if I weren't 6'1", I might be playing one"
Hello Stephen, if it's as good as the last Janzen violin I heard it must be very good indeed! A very fine maker. June 30, 2017, 9:32 PM · How about a bench copy indistinguishable from the original. Vuillaume did one of Paganini's Canon. I'm not sure if it is really true that he could not tell the difference, but if so that would certainly be a challenge! Edited: July 1, 2017, 4:02 AM · From the mid 60s, I worked as an Architect of fine homes and commercial buildings. I retired in 2007. From the late 40`s I have been working as an Architect involved in family violin making part time and still do full time today. Success for me only began when I discovered that the client was the real violin Architect and not me. Violin monuments to myself did not sell well, nor did it work well for my clients. Beyond using my own violin pattern today, I interview the violin player to incorporate their ideas as much as possible. This interview has to be the players ideas and not mine. Success for me as a violin builder today is defined by seeing and hearing 1st hand the excitement of the violin player after the violin has been completed. Edited: July 1, 2017, 7:18 AM · "How about a bench copy indistinguishable from the original." I have seen one bench copy of a Strad (by Curtin/Alf) that really was visually impossible to tell from the original, even having both side-by-side. It's a massive amount of work, copying every repair and ding and getting it to look right, and I don't think it can be done without having the original in-hand for constant reference. They sounded completely different, though (I preferred the copy, but the Strad had more high end). This kind of effort (and extra cost) usually only makes sense for the owner of the original. As far as duplicating the sound... not likely. I think only a few makers could even make a reasonable attempt at doing that, and I am unaware of any totally successful results. An excellent challenge, though. Edited: July 2, 2017, 6:26 PM · Jean - re the high D on the E string, in my experience - and even in my own collection - some violins do sound strong and clear on that high D but not on the C# or Eb and with others it may be the reverse. What I don't remember coming across is a violin in which all the notes in that neighborhood sound equally strong. Another thing I have found is that a violin may sound fine on a particular high note a cappela or even with piano - but when playing first violin in orchestra that note disappears - I just can't hear it and have to go by 'radar' for a while. That high D is sometimes a good climactic note to have in solo rep. In orchestra, most high passages see the G and A below that D get quite a lot of action - maybe the Bb and B natural too - and that's where I will get that 'disappearing act' sometimes, kind of like dropping a glass in a full bathtub. As for 'fancy fiddles' the 2 fanciest in my collection, both coincidentally made in 2011, are one of my Madays and one of my V. Villas. Ed Maday and I kind of designed it together after tossing some ideas around. I had asked him at first if he would copy a particular del Gesu - the "Plowden". He demurred, saying that he needed to take a break from that sort of thing. I said OK, design it any way you like but could I contribute some ideas for design details. He said fine. So he basically made a 'fantasy' del Gesu design, meaning not a copy of any particular extant del Gesu but one that del Gesu could conceivably have made. Then came my ideas: Ed makes all kinds of string instruments. I had admired a viola d'amore that he made and asked him if he could replicate more or less the same orange-brown varnish. He said sure. Then I asked him if in lieu of a scroll, could he make a lion's head like you see on some Stainers. He again said sure. Finally, I asked him if he could put a gold-leaf Latin inscription on the ribs along the lines of some Amatis and some French violins. Again he agreed. We really both had fun with the project! After some thought and asking some Latin buffs to make sure I got it right, I came up with IN MVSICA FELICITAS (in music felicity). He even carved my initials in the neck root button, and wrote in the label that he made it special for me! Could it be any more my violin? I think it looks amazing! It has a deep, chocolaty sound. The 2011 violin that Vittorio made for me is a very close copy of a particular ornamented Amati violin known as the "Count Youssipoff". Vuilliaume also made some copies of that one. 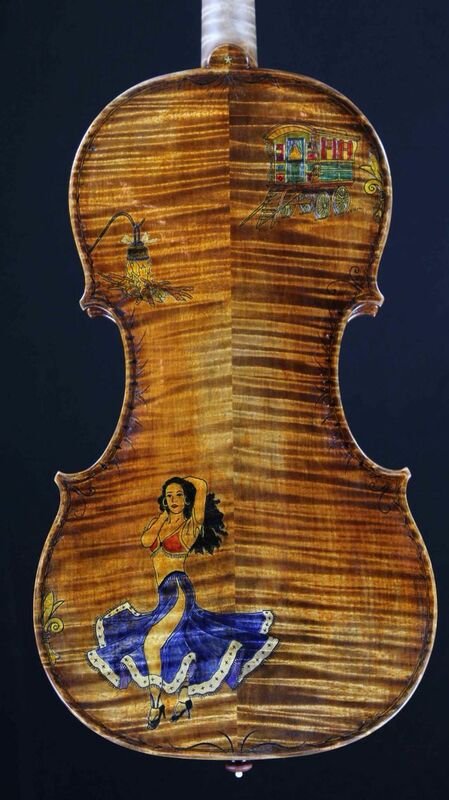 This is an inlaid violin - not painted, and very labor-intensive. 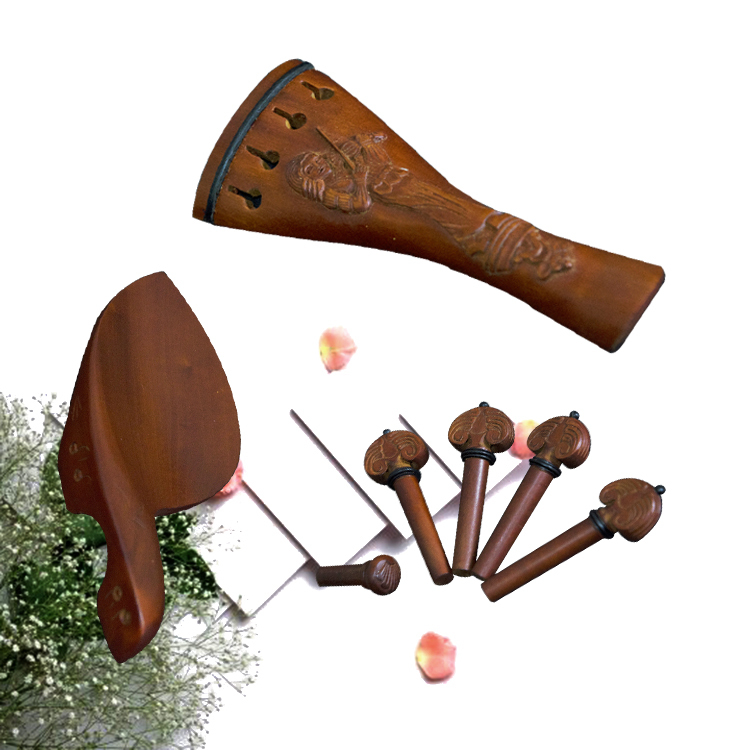 It looks exquisite, with a light, golden reddish-brown varnish and beautiful wood and has a bright, brilliant sound. Edited: July 2, 2017, 10:07 PM · Check the g string afterlength. Those are the typical tunings for them. The afterlenghts does cause those notes to be less prominent when played. July 3, 2017, 4:44 AM · I know - as they have been checked out - that with one exception among my violins, my measurements are typical. July 3, 2017, 5:05 AM · Ok, this may have sounded bad. I did not suspect to tell you about your own equipment, you are a far better violinist than I am and expected you have your fine equipment in good check ups. It was more for other readers with less knowledge. July 5, 2017, 6:48 AM · Andreas, I have the ultimate challenge for you. Learn to play the dam thing! If you do already, plan a recital with a fun and extending repertoire.